Last week I was not okay, in fact I was really sick (and I’m never sick!). So to be honest, I didn’t know what to do. Should I go to the doctor, or just stay at home or do something else? It brought me to this question: why do we get sick in the first place? Why do certain problems keep coming back again and again in our lives and how can we truly solve these issues? How can we improve the quality of our lives in a way that is sustainable, enjoyable and brings lasting change? I have received little pieces of the puzzle over the years, but wasn’t really able to put it together, until this moment. I decided to listen to my body and take it easy. I stayed in bed most of the time and ate healthy vegan food. Whenever I could I did some moderate exercise in my room and even swam a little bit in the pool to at least move my body. Now I’m much better and here’s what I learned. I have observed many people with problems. The majority of people are afraid of facing their fears and solving their problems (myself included). We either ignore our problems and become numb to them or we make other people responsible for solving our problems. For example, we may get a headache, a fever or some other kind of health condition. Most people either ignore those symptoms until they get bigger or heal with time, or they delegate their health to doctors and chemicals. I hardly see anyone looking at their symptoms to figure out what their body is trying to tell them. Back in 2014 I suffered from immense pain in my right ear. It got worse and worse every day up until the point that I had to see a doctor. The doctor referred me to the ear, nose and throat department of the hospital. So I went to the hospital on a Friday morning. The specialist looked in my ear and said that there was a big hole in my eardrum. I needed to come back the Monday after the weekend and get an urgent and expensive operation. The specialist explained that a surgeon would cut a small piece of skin from another part of my body and use that to cover and close my ear drum. It would be painful and take more than 6 months to heal, without any guarantee that it would actually work. I went back home feeling not okay, because I hate operations, especially if they don’t guarantee success and are painful! Back home I got thinking: My ear is related to hearing. I can hear properly but maybe it is my body’s feedback trying to tell me that I don’t hear something, like myself, since there is a hole in my ear drum. So I started to make a list of all the events in my life where I didn’t listen to myself: situations where my intuition was right but I didn’t listen to it, situations where I subordinated to others instead of making my own decisions, and my life in general what my heart told me to do and that I didn’t do. The list was super long and I got tears of gratitude for this realization. On Monday I went to the hospital as planned, even tough I didn’t feel any pain anymore. The surgeon looked in my right ear and looked a bit confused. He then looked in my left ear looking even more confused. He then looked again in my right ear with a little camera where I could see my ear drum on a monitor. Then he took the little camera out of my ear and said: I don’t know why you’re here, but there is definitely nothing wrong here. And he sent me back home without any charges or follow-up appointment. How is this possible? 3 days earlier I was diagnosed with this massive hole in my ear drum and was told I needed this operation and at least 6 months of healing time. And now within 3 days I was completely healed? I believe that our body’s are more intelligent than we think. When we look at our symptoms and try to find the root causes of it and solve them, the symptoms will disappear and we have learned our lesson. And when we simply ignore it or make someone else responsible for our issues, the underlying causes could remain and the symptoms may come back next time, because you haven’t learned your lessons or transcended your challenges yet! And health conditions are not the only thing that we can suffer from: how about loneliness, depression, stress, poverty, jealousy and other negative situations? Instead of fighting these events immediately with types of instant gratification like chemicals, shopping, partying and specialists, I would recommend another approach. First of all, think by yourself: it’s okay not to be okay! I don’t mean that you should live in that negative space. I mean that you can be okay with the situation and face the causes instead of trying to run away from it or to ignore it. Secondly, become truly grateful for the issue that you are facing. Realise that it will help you to move to the next level in life and help you to become a better person. You may even be able to help other people later on to solve similar problems. Gratitude for your problems will help you to transcend these problems and help you to improve the quality of your life. If your partner broke up with you, transcend your broken heart into a feeling of gratitude. If you lose your job, transcend that into a feeling of gratitude. It will lead to something better, as long as you’re willing to let go. And thirdly, what can you learn from the situation? And how can you take full responsibility? Responsibility sometimes has a negative meaning attached to it. But it simply means the ability to choose a response! What response do you want to choose? 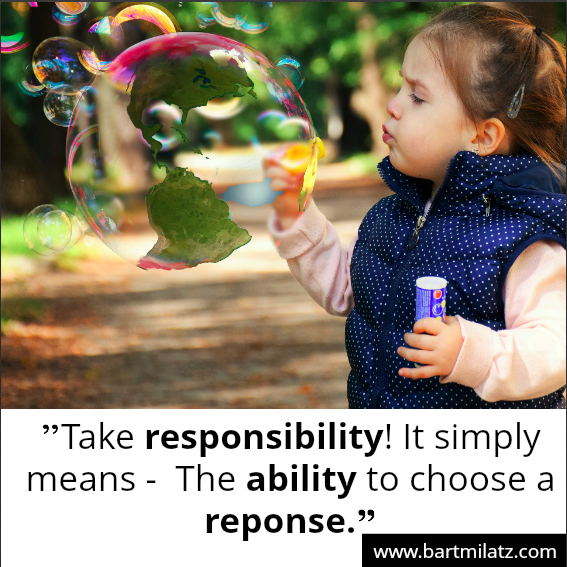 Choose the best response and take responsibility. Become proactive instead of reactive. What is the feedback you are getting and how can you learn from it to make better choices? Be yourself, accept yourself and love yourself and the issues that come your way. See everything as on the way instead of in the way. Now I would love to hear from you! 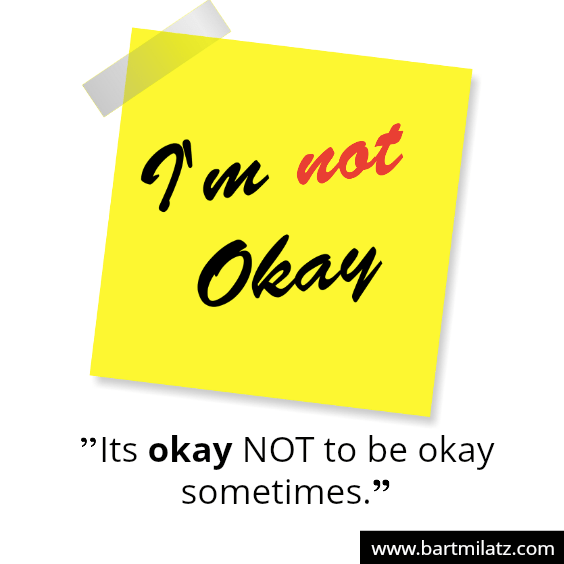 Do you have a situation in your life where you were not okay, and you managed to transcend the situation? What was that situation and how did you move out of it? Leave your comments in the section below.